Clear your calendars because on Saturday, March 4, 2017 Heart of the Valley Animal Shelter and Big Sky Resort are hosting the 13th annual Big Sky Snowshoe Shuffle 2017. This family-friendly, dog focused event will take place at Big Sky Resort's Madison Base Area at 6pm. Will you be there? The Big Sky Snowshoe Shuffle 2017 is a chance for you to get outdoors with the Big Sky community and their furry friends for an off leash adventure while raising money for Heart of the Valley, the community animal shelter. This social event explores one of the more scenic areas of Big Sky after the slopes close. 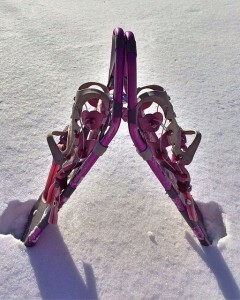 Are you and your dogs up for a torch lit snowshoe hike in the shadow of Lone Mountain? We thought so. The course covers approximately 2 miles and should take about 45 minutes. Since the course is on groomed terrain, it can be done with or without snowshoes - so everyone is welcome to come and enjoy a fun evening. The Big Sky Snowshoe Shuffle 2017 ends at the Headwaters Grille, where all participants are invited to an apres chili dinner and a raffle that includes some amazing prizes. Not only does the Snowshoe Shuffle support a good cause, it's also an absolute blast. To participate in the Big Sky Snowshoe Shuffle 2017, you'll need to buy a ticket. Discounted tickets are available at Bridger Animal Nutrition or Heart of the Valley Animal Shelter. Or show up at 5:30pm on March 4 and buy a ticket. Adult tickets cost $25 and Kids 10 & under can participate for free. All proceeds benefit Heart of the Valley. Everyone is invited to attend the Snowshoe Shuffle in Big Sky. It's fun for all ages and it might just be the most fun your dog will have all winter long. Plus, every dog gets a participation bandana! Get the latest information on Facebook or at HeartOfTheValleyShelter.org.